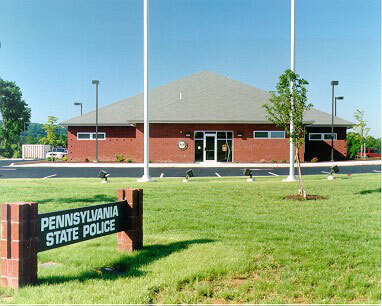 State police buildings across the state, most of which were built in the 1940s and 1950s, were experiencing failed infrastructures and obsolete functionality. To bring them into the 21st Century we implemented a multi-step process to develop an architectural program that could be adapted throughout the state. 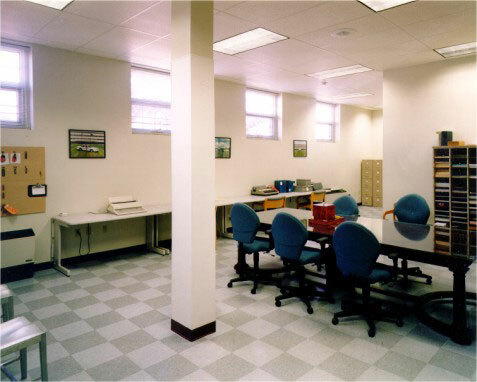 We conducted many interview and fact-finding sessions with staff to determine how spaces needed to be integrated, as well as separated, for different purposes. We examined different buildings to create design ideas that would be appropriate for the age and historic character of the building styles. Outdated infrastructures such as HVAC and electric were replaced with energy-efficient and technology appropriate systems. And we created a comprehensive interior design template that coordinated styles, finishes, details, furnishings and colors. This Troop F Headquarters in Montoursville is one of the newly renovated facilities. New exterior design improvements at the Troop J Headquarters building in Lancaster include new entry stairs, curved retaining walls, and an entry ramp. New windows were installed to match the older historic window style and configured to maintain the original integrity of the building. The HVAC grills under the windows make it possible to have individual room controls inside. 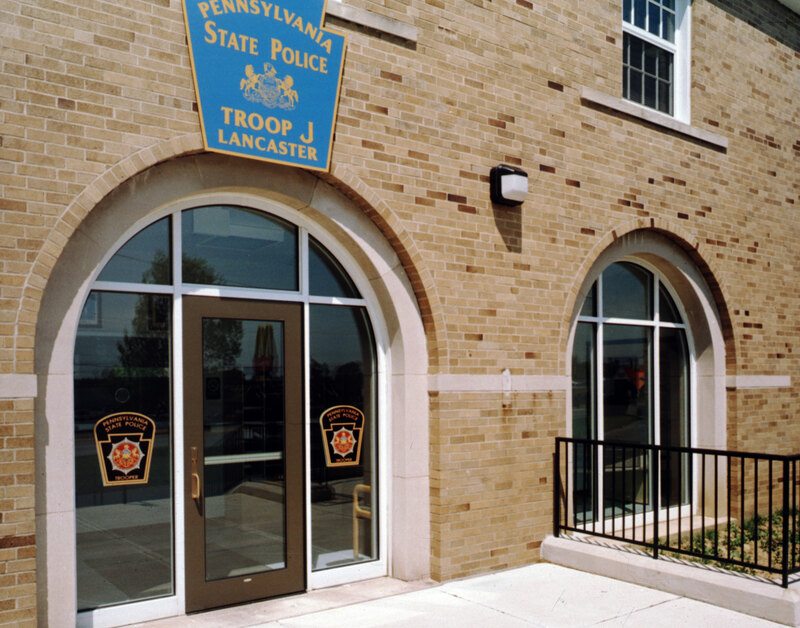 The Troop J Sub-station in Ephrata, PA required new construction. The central main entrance now makes it easily accessible for the public. New windows are installed near the roofline for safety and security. 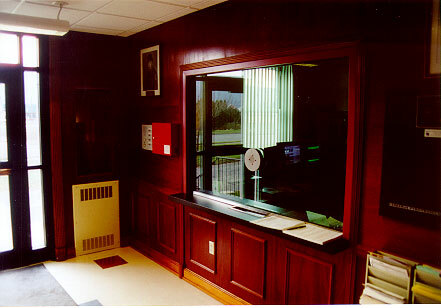 Interior improvements at the Montoursville station include bullet resistant transaction windows and walls, a redesigned public lobby with wood paneling, new floors, a new color scheme and improved lighting. 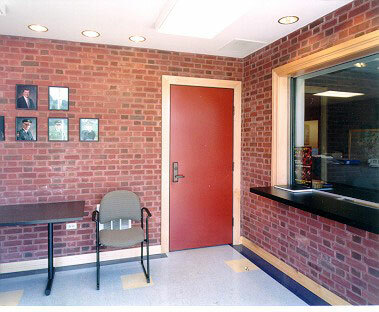 In the Ephrata sub-station the new lobby walls are brick in keeping with the historic character of the building. Bullet resistant transaction windows and walls are used here as well, and are a standard feature provided for this project. This interior view of the Lancaster squad room shows that even with the raised heights of the windows, the room still receives natural light. The pale soft colors in the checkerboard floor add visual interest to the muted décor. 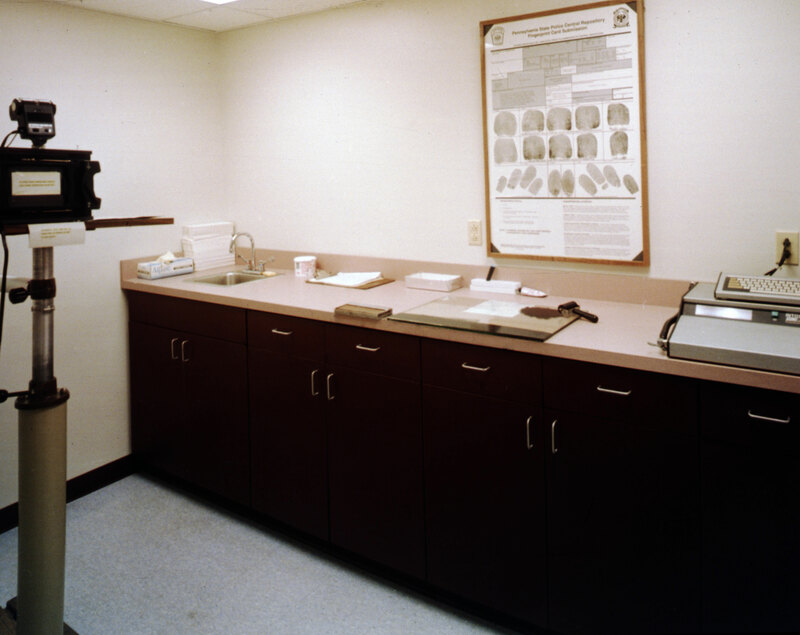 Several smaller rooms are adjacent to the main squad room for use when officers require a private area for confidential communications. 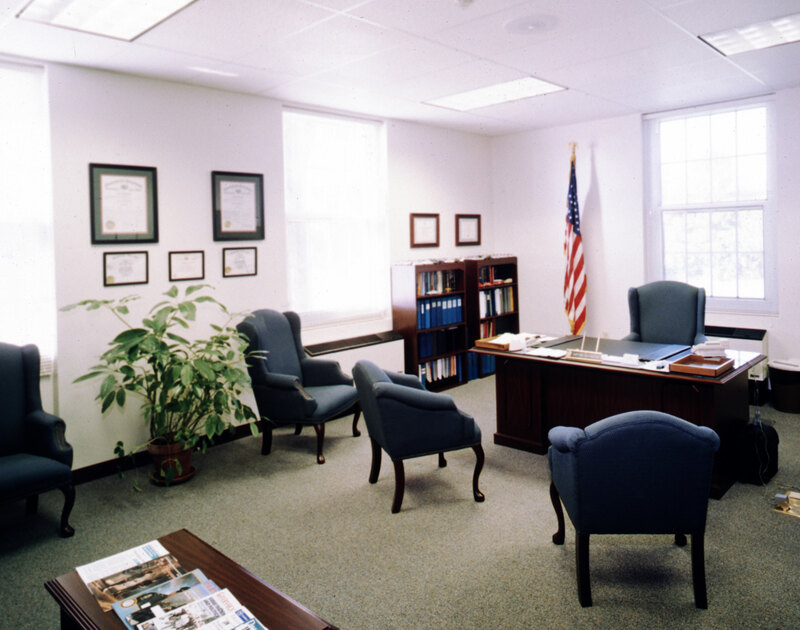 The commander’s office has a corner location that gives him a clear line of sight to anything that might happen outside the building, letting him react quickly if an emergency situation would arise. This close-up of the main public entrance at the Lancaster station shows the freshly cleaned brick exterior and arched entry for the door, mirrored by arched framing around the adjacent new windows. This design feature gives the building a fresh, updated look while still maintaining the historic character.